Cork is composed of dead cells that accumulate on the outer surface of the cork oak tree. Because of its honeycomb-like structure, cork consists largely of empty space; its density (weight per unit volume) is one-fourth that of water. Unlike a honeycomb, however, cork consists of irregularly shaped and spaced cells having an average of 14 sides. With 625 million of these empty cells per cubic inch (40 million per cubic centimeter), cork is like many layers of microscopic Bubble Wrap, making it an effective cushioning material. Its low density makes cork useful in products like life preservers and buoys. The large amount of dead-air space makes cork an effective insulation material for both temperature and noise. Furthermore, it is fire retardant; flames will only char the surface, and no toxic fumes are generated. Cutting the surface of cork turns many of the microscopic cells into tiny suction cups, creating an effective non-slip surface. In addition to being flexible, cork is highly resilient. After being crushed under a pressure of 14,000 lbs/in 2 (96,000 kPa), cork will regain 90% of its original size in 24 hours. Cork absorbs neither dust nor moisture, and it resists both rot and insects. Highly resistant to wear, it is used for polishing diamonds. Among the many products made from cork are flooring materials (e.g., linoleum), shoe insoles, roofing panels, gaskets, safety helmet liners, bottle stoppers, dartboards, bulletin boards, and cores for golf balls and baseballs. Numerous artificial materials have been developed to substitute for cork in specific applications (e.g., a synthetic pea in a referee's whistle, foam insoles for shoes, or Styrofoam life preservers). However, no general substitute has been developed for cork that can be used in diverse applications. Cork bottle stoppers have been found in Egyptian tombs dating back thousands of years. Ancient Greeks used cork to make fishing net floats, sandals, and bottle stoppers. Two thousand years ago, Romans widely used cork in variety of ways, including life jackets for fishermen. For hundreds of years, Mediterranean cottages have been built with cork roofs and floors to keep out summer heat and winter cold—and to provide a soft walking surface. Glass bottles were invented in the fifteenth century, but their use did not become widespread until the seventeenth century. The popularity of cork as a stopper led to deliberate cultivation of cork trees, which prior to about 1760 had simply been harvested wherever they happened to grow. The revolutionary crown cap—a metal lid lined with a disk of natural cork commonly known as a bottle cap—was invented in 1892. A great deal of the cork harvest was wasted until around 1890, when a German company developed a process for adding a clay binder to cork particles and producing sheets of agglomerated (composite) cork for use as insulation. The following year, an American named John Smith developed a technique for producing pure-cork agglomeration out of waste material by subjecting cork particles to heat and pressure without adding any binder. The next major development occurred in 1909 when Charles McManus invented a type of agglomerated cork that could be used to line crown caps. Since then, many other techniques have been developed to produce cork compounds with a variety of properties and uses. The raw material for cork products is harvested from the cork oak tree (either the evergreen Quercus suber or the deciduous- Quercus occidentalis). The trees typically reach a height of 40-60 ft (12-18 m) and a trunk circumference of 6-10 ft (2-3 m). Virtually all of the world's commercial cork trees grow in the western Mediterranean region and the Iberian Peninsula. Portugal's cork forests are the most productive. Accounting for 30% of the existing trees, they produce half of the world's harvested cork. A cork tree is ready for its first harvest when it is about 20 years old. The first harvest is of poor quality, and can only be used to make agglomerated cork products. Subsequent harvests occur at nine-year intervals, when the cork layer reaches a thickness of 1-2 in (2-5 cm). The harvest from a young tree yields about 35 lb (16 kg) of cork, while the yield for an older tree may be 500 lb (225 kg). Each tree has a productive life of about 150 years. 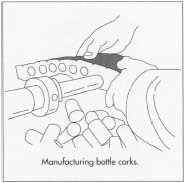 During the production of bottle stoppers, chemical baths are used to condition the corks. Among the more popular are a chlorinated lime bath followed by a neutralizing bath of oxalic acid, a hypochlorite bath neutralized by sodium oxalate, and a peroxide bath neutralized with citric acid. Production of compound agglomerated cork involves adding a binder or adhesive agent to cork granules. Different binders are chosen, depending on the qualities desired in the ultimate product (e.g., flexibility, softness, resistance to wear). Among those frequently used are asphalt, rubber, gypsum, glue, and plastic. Cork has been used since antiquity as a stopper for bottles because of its compressive abilities. During the Renaissance, cork stoppers were commonplace, and cork-oak trees were grown and processed in the Pyrenees Mountains especially for this purpose. Wine bottles were commonly sealed with oiled hemp. When Pierre Perignon (1638-1715) invented champagne in 1688, he found that the gaseous pressure inside his bottles blew out the hemp stoppers. To solve the problem, he invented corks held in place by wire. The modern metal bottle cap was developed by the prolific Maryland inventor William Painter, who patented his first stopper in 1885. By 1891, his definitive design, a cork-lined metal cap with a corrugated edge that is crimped around the bottle lip, appeared. Painter called his invention the "crown cap," founded the Crown Cork and Seal Company to market it, and became very wealthy from it. The crown cap was the industry standard for nearly 80 years. In 1955, the crown cap's cork liner was replaced by plastic, and a high-speed machine to inspect crown seals was introduced in 1958. In the 1960s, the Coca-Cola company offered lift-top crown caps. The push-on, twist-off cap was first developed for baby food. 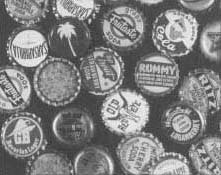 Screw caps for carbonated beverages appeared in the 1960s and 1970s and are the standard today. 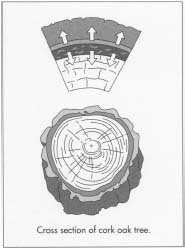 1 Using a specially designed hatchet, the harvester slices through the cork layer on the trunk of the tree, taking care not to cut deep enough to damage the living portion of the trunk. Horizontal cuts are made at the base of the trunk and just below the lowest branches. A few vertical cuts separate the circumferential cork ring into sections of an appropriate size. Using the wedge-shaped handle of the hatchet, the harvester strips each panel of cork from the tree. On some large trees, cork is also stripped from the lower branches. 2 The cork planks are stacked outdoors and left to cure for a time ranging from a few weeks to six months. The fresh air, sun, and rain encourage chemical changes that improve the quality of the cork. By the end of the curing process, the planks have flattened out and lost about 20% of their original moisture content. 3 The planks are then treated with heat and water to remove dirt and water-soluble components like tannin, and to make the cork softer and more flexible. This process typically involves lowering stacks of cork planks into large copper vats filled with boiling water containing a fungicide. Heavy weights are placed on top of the cork to keep it submerged for 30-75 minutes. 4 When the planks are removed from the vat, a hoe-shaped knife is used to scrape off the poor-quality outer layer of cork, which amounts to about 2% of the volume of the plank but 20% of its weight. The planks are stacked in a dark cellar and allowed to dry and cure under controlled humidity for a few more weeks. 5 The cork planks are trimmed to a uniform, rectangular shape and are sorted by quality. The finest quality material will be used to make natural cork products like wine bottle stoppers. Poorer quality material will be ground and used to make composition or agglomerated cork. 6 Cork slabs of the desired thickness are placed in a steam chamber for 20 minutes to soften them. The slabs are then cut into strips whose width corresponds to the intended length of the bottle stoppers. The strips are fed through a machine that punches hollow metal tubes through them, removing cylinders of cork. Cork is composed of dead cells that accumulate on the outer surface of the cork oak tree. Harvests occur at nine-year intervals, when the cork layer reaches a thickness of 1-2 in 12-5 cm). The harvest from a young tree yields about 35 lb (16 kg) of cork, while the yield for an older tree may be 500 lb (225 kg). them past a rapidly rotating circular knife. As they pass the blade, the corks are also revolving on the conveyor, so they are trimmed to a taper. 8 Both cylindrical and tapered corks are washed, bleached, and sterilized in large vats. Rotating wooden paddles continually push the corks down into first a washing solution and then a neutralizing solution. 9 After being dried in a large centrifugal dryer, the corks may be marked with an identifying label (with ink or a hot-metal stamp). Some are also coated with a sealant such as paraffin or silicone. Then, they are packed in airtight bags in quantities of 1,000 or 1,500; the air is removed from the bags and replaced with sulfur dioxide (SO 2 ) to keep the corks sterile. 10 Waste cork is passed through a machine that breaks it into small pieces. The pieces are washed and dried, and then sent through two successive grinders to further reduce the particle size. After another washing and drying process, the particles are screened for uniform size. Cork intended to be used as bottle corks is first softened by steam and then cut into strips. Next, the strips are fed through a machine that punches hollow metal tubes through them, removing cylinders of cork. mold. Alternatively, the mold is baked at 500° F (260° C) for four to six hours. Either process binds the cork particles into a solid block by activating their natural resins. 12 Compound agglomerated, or composition, cork is made by uniformly coating the cork granules with a thin layer of an additional adhesive agent. The coated granules are pressed into a mold and slowly heated (the temperature varies, depending on the adhesive used). When removed from the mold and cooled, the blocks are stacked to allow air circulation and are allowed to season. 13 The agglomerated cork is cut for its intended use. For example, sheets may be cut from rectangular blocks. Or if a tubular mold was used, the resulting cork rod may be sliced into discs. A large, cylindrical block might by revolved against a knife blade to shave it into a long, continuous sheet that is rewound into a roll. Cork waste generated during the manufacturing process is ground and used to make agglomerated cork products. Cork powder that is generated by the grinding process is collected and burned to help fuel the factory. Chemical components removed from cork during its processing can be recovered as useful byproducts and include tannin (used for curing leather), hard wax (used in products like paraffin, paint, and soap), resinous gum (helps vanish adhere to copper and aluminum), and phonic acid (used to make plastics and musk-scented toiletries). Cooke, Giles B. Cork and the Cork Tree. New York: Pergamon Press, 1961. "Transformation Procedures for Natural Cork." Natural Cork Quality Council. http://corkqc.com/ctcor3.htm (February 1999). Oliveira, Manuel, and Leonel Oliveira. "The Cork." http://www.portugal.org (February 1999). "The Story of Cork." http://www.shofftackle.com/loadit.html (February 1999). under Byproducts/Waste (penultimate paragraph 2nd last line and in brackets) the spelling of "vanish" perhaps should be varnish? Thank you for the article.